Use the options in the dropdown menus below to select the DC Voltage and the Power Rating required. Click on the “ADDITIONAL INFORMATION” tab below to see the available options for this product. 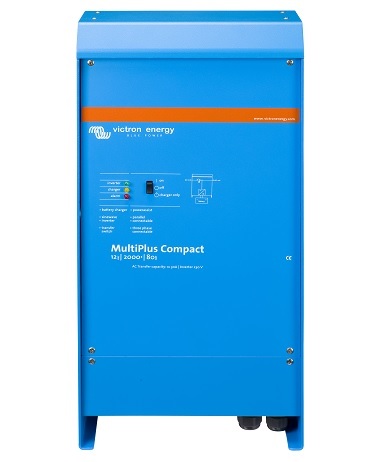 The inverter charger MultiPlus Compact is a powerful true sine wave inverter, a sophisticated battery charger that features adaptive charge technology, and a high-speed AC transfer switch in a single compact enclosure. Models range from 800VA to 2000VA per module. Ideal for use in marine, renewable, off grid or mobile power systems. MultiPlus inverter chargers are used the world over in numerous applications and continue to give unequalled performance and reliability. MultiPlus products come with Victron’s 5 year world wide limited warranty so you can be safe in the knowledge that you are purchasing a high quality and extremely reliable device.